The nation’s oldest kite festival is a fresh-air ballyhoo of kite flying contests, food, games and more. 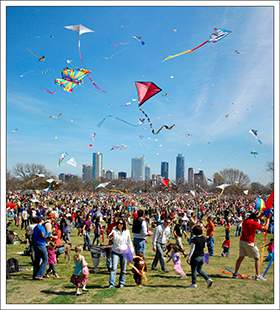 Austin’s 2016 Zilker Park Kite Festival, presented by ABC Home & Commercial Services, takes place March 6 and is free to attend. Hundreds of colorful kites dot the Sunday sky beginning at 10 a.m.
Kite tournament events haven’t changed much since 1956, when the contest opened to competitors of all ages. Today’s Kite Contest is open to anyone who wants to compete. Only homemade single-line kites are accepted and there is no cost to enter. 50-Yard Dash (Kids only): Children 7 to 12 years old fly kites on 50 feet of string, simultaneously racing to the finish line and flying their kites. Highest Angle Kite (Youth and Adult): Contestants will release 200 feet of string and stand on a designated line. The kite flying at the highest angle overhead from the point of mooring wins the competition. Steadiest Kite (Youth and Adult): The least active kite in the air wins! Most Unusual Kite (Youth and Adult): Kites are judged on theme, construction and design. Largest Kite: Square footage of the sail area will determine the winner here. Oldest and Youngest Kite Fliers: Awards will be presented to the oldest and youngest event contestants. Contestants must fly a kite unassisted to be eligible. Some of Austin’s finest food vendors will be on-hand serving up goodies from booths and trucks. Stop by Amy’s Ice Cream, Hat Creek Burgers, Heros Gyros, Maudie’s Tex-Mex and more. There will also be plenty of barbecue, funnel cake, coffee options and shaved ice treats and activities for kids of all ages. Susan is the director of content & publishing at Visit Austin. A native Houstonian, this 30-something going on 18, has made Austin her own personal playground for the last 13 years. Some of her favorite activities include people watching on any of Austin’s popular patios, enjoying a run along Lady Bird Lake, and spending her paychecks at the many boutiques around town.